Find a large collection of images from many years of exploration by kalteng-consultants. Read the latest documents which tells you what kalteng consultants is doing. 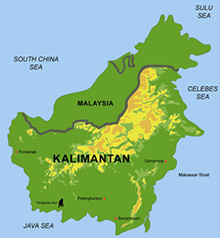 Old South Borneo Map, now Central- and South-Kalimantan, partly East-K. - In underlined villages mission station are located. Villages with black points shows the presense of European officers. 36 km north of Palangka Raya in Rungan Sari, near to the Tangkiling Hills and Tangkiling Village. Dr. H-DV Boehm Jalan Tjilik Riwut km36, No.33, Rungan Sari, Sei Gohong, Palangka Raya, Central Kalimantan, 73225, Indonesia.